According to our sources, Lyft drivers can make an average of $17/hour or $33,669 annually. That’s a pretty decent wage, especially if it’s a side gig or second job for you. But is it the right job for you? Keep reading to find pros and cons, expected earnings, other driver’s testimonials, reviews by city and driver requirements. Should You Drive for Uber or Lyft? Hourly guarantee – If you don’t earn the guaranteed amount of money during a specific time, Lyft will pay you the guarantee after commission. This is only available in some cities. Prime Time – When the demand for drivers is higher, passengers will be charged an extra percentage which increases the price for the ride. Express Pay – Lets drivers cash out their pay whenever they want as long as it’s $50 or more. Read this article if you want to find out how much a Lyft driver can make. How to Work for Lyft? Getting set up to work for Lyft is actually pretty simple. Click our link and you’ll be directed to a page where you can apply to drive for Lyft. Then Lyft will perform a background check to make sure you are who you say you are and it is considered safe for you to accept riders. Lastly, your car will need to have passed your state car inspection. How Long Does it Take to Become a Lyft Driver? According to this Quora thread (written by a Lyft employee and commented on by drivers), the approval process could take two days to two weeks. However, one of the drivers who commented said it took 23 days. Below are some Lyft driver reviews that we’ve compiled from the internet to give you an idea as to whether people like working at Lyft or not. Lyft has recorded undercover videos where celebrities posed as drivers and then revealed themselves as stars later in the ride. There are many different stories to enjoy including Shaq, Odell Beckham Jr., DJ Khaled and more, but we thought you might like this Demi Lovato video that has more than 11 million views. We have taken the time to collect reviews and more geographic specific information from several of the large U.S. cities. In addition to reading the articles, be sure to read the comment section for any driver-specific reviews and tips. Or if you have personal experience there, feel free to leave your own comments to help other local drivers. Which Is Better to Work for Uber or Lyft? If you talk to any Lyft or Uber drivers, they’ll probably tell you to drive for both in the beginning. This will give you the opportunity to see if working for Uber vs Lyft is easier and which one can make you more money. Still interested in learning the lowdown on each company? 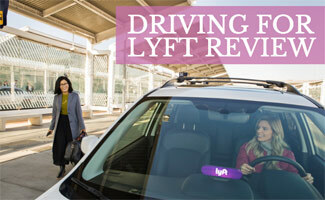 Read our how driving for Lyft compares to Uber comparison article. Why are you considering driving for Lyft?